From the 11th April this year all food business operators in the UK have to abide by the European Commission Regulation (EU) 2017/2158 which covers Acrylamide. Acrylamide has potentially harmful effects on health & tests have demonstrated that acrylamide in the diet of animals can lead to cancer. It is recommended that the amount of acrylamide we all eat or drink should be reduced, as a precaution. What can food business operators do to reduce acrylamide in the food ? The food production industry has been working hard to identify and introduce measures to reduce acrylamide levels in food, including limiting acrylamide formation in different foods and processes. 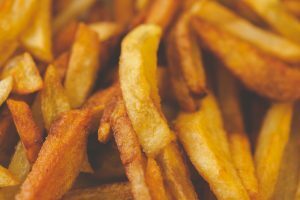 The new legislation will require all affected food business operators to put in place practical, simple processes to manage acrylamide within their processes. What practical steps should you take ? you should produce a golden yellow colour or lighter when frying, baking, toasting or roasting foods which contain starch. Overcooked foods produce much higher levels of acrylamide. keeping raw potatoes in the fridge can lead to the formation of free sugars in the potatoes & they should not be kept refrigerated.This process can increase acrylamide levels. Raw potatoes should be stored in a dark, cool place at temperatures above 6°C. When acrylamide is produced during high temperature cooking, water, sugar and amino acids combine to create a food's distinctive flavour, texture, colour and taste. Longer cooking times and higher temperatures, produces more acrylamide than than short cooking times and lower temperatures. The new regulation (2017/2158) specifies best practice, measures and levels for the reduction of acrylamide in food. Businesses will be expected to do the following, which will be checked by environmental health officers on inspections. ensure staff are aware of acrylamide as a potential food safety hazard and have an understanding of how acrylamide is formed in the business's food. For small food businesses it is sufficient to include a regular check on fried product & making a note in the food safety documentation. It is not intended that small and micro-businesses are not burdened so measures will be proportionate. Allergy advice and training can be provided by Cowan Catering.